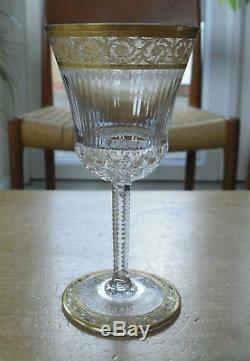 For sale is a set of 6 wine glasses, manufactured by St Louis Crystal, in the "Thistle" pattern. The design features rippled bowls with bands of short vertical cuts below. 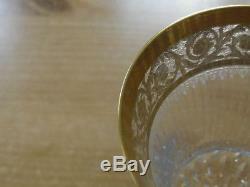 The upper section features elaborately etched and gilded floral bandssee pic. The feet are similarly decorated & the stems are notchedsee pic. The glasses measure 3 1/48. 25 cms in diameter(at the rim) & a little over 6 3/8(a little over 16.25cms) tall and hold 7oz filled to the brim. 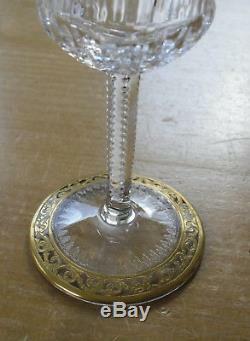 There are no apparent maker's marks to the base which I believe indicates the glasses were manufactured before 1936. The glasses are in great condition, being free from chips, cracks, nicks and nibbles. They appear to have seen little, if any use with no signs signs of wear to the gildingsee pic. The glasses will be well wrapped and courier delivered. The quoted price is for UK mainland only(excluding remote areas). If you have any questions or require further photos, please don't hesitate to ask. Thanks for your interest in one of my many items for sale, Gavin. 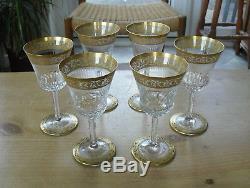 The item "Set of 6 St Louis Crystal Thistle Pattern 7oz Wine Glasses 6 3/8(16.25cms)" is in sale since Saturday, March 17, 2018. 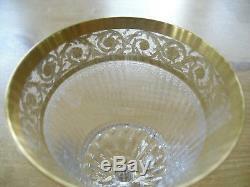 This item is in the category "Home, Furniture & DIY\Cookware, Dining & Bar\Glassware". The seller is "4948gavin" and is located in Leamington Spa, Warwickshire. This item can be shipped worldwide.